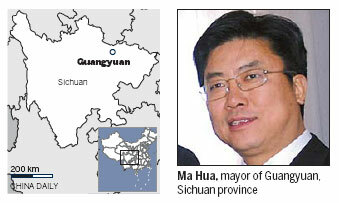 Guangyuan in Southwest China's Sichuan province is committed to building itself into a regional transport hub linking Sichuan and Northwest China by 2014, says Mayor Ma Hua. Ma, a deputy to the National People's Congress, said the massive magnitude-8.0 earthquake that hit Sichuan in May 2008 paralyzed the city's traffic system. But in less than four years, great achievements have been made in transportation construction in this devastated land, which has greatly boosted the local economy. "To develop the city's economy, we must first develop the traffic system," Ma said, adding that in the past the city's poor transportation infrastructure had long been a bottleneck constraining its economic and social development. Guangyuan is located at the junction of Sichuan, Shaanxi and Gansu provinces, and could serve as a regional transportation hub connecting Sichuan with its neighboring provinces. But, Ma said, Guangyuan failed to take up the role and had been "marginalized" due to its poor traffic conditions. Being aware of the importance of road traffic for the city's economic development, Ma said Guangyuan should take advantage of its unique geological position to make itself a regional transport hub by 2014 to "achieve the maximum economic benefits". "We must make traffic development our top priority in the city's post-quake reconstruction," Ma said. He said an investment of 26.7 billion yuan ($4.22 billion) has been used to improve the city's transportation system after the deadly earthquake. Statistics show that in 2004, Guangyuan only had one expressway connecting the city with adjacent Mianyang, the second-largest city of Sichuan. But today, in addition to the Mianyang-Guangyuan Expressway, the city has added four new highways, connecting it not only with major cities within Sichuan but also cities in Shaanxi and Gansu provinces. "The improved road traffic is a strong impetus for the development of distribution and tourism in Guangyuan and its surrounding areas," Ma said. He said the high-speed railway between Guangyuan and Xi'an, capital of Northwest China's Shannxi province, is also expected to start operation in the fourth quarter of this year. In addition to the development of road transportation, Guangyuan has also invested a lot in developing the city's air traffic. Last year, more than 80,000 passengers used the Guangyuan Airport. Apart from the three old routes to Beijing, Hangzhou and Guangzhou, Guangyuan Airport will launch flights to Chongqing and Kunming later this year. "We will open flights from the city to more places in China to attract more opportunities for the city's economic development and cultural exchanges." Ma said he has seen the opportunities brought about by this traffic improvement campaign, as in recent years more large companies have started to pay attention to Guangyuan. "We hope more big domestic and foreign companies would consider Guangyuan as an ideal investment destination and settle down here in the future," Ma said. "We will seize the opportunities brought by China's move toward developing the west, and hope the central government could give more financial support to consolidate Guangyuan's position as a regional transport hub," Ma added.